We are pleased to announce that we were successful in applying for a federal grant to retrofit and renovate our Paris apartment building with an accessible elevator. The elevator will ensure the office space on the upper floor is accessible for all employees with disabilities as well as members of the community, such as visiting families staying in the apartment. We applied under the Enabling Accessibility Fund for Small Projects and received the maximum grant, $100,000. Thank you to Employment at Social Development Canada for recognizing the value in our accessibility project. Thanks also to supporters including Brantford-Brant MP Phil McColeman, whose staff provided valuable input and advice, and Brantford-Brant MPP Will Bouma and Brant Accessibility Coordinator Sheena Yarek for their letters of endorsement. The project is expected to take 25 weeks. A hoistway will be built in the breezeway to house the elevator. Please look for future information and updates on the elevator project. We are pleased to announce that we were successful in applying for a federal grant to purchase a side-by-side tandem bicycle equipped with an electric motor. We applied under the Enabling Accessibility Fund for Youth Innovation Projects and received the maximum grant, $10,000. Thank you to Employment at Social Development Canada for recognizing the value in our project. Thanks also to supporters including Brantford-Brant MP Phil McColeman, whose staff provided valuable input and advice, and Brantford-Brant MPP Will Bouma and Brant Accessibility Coordinator Sheena Yarek for their letters of endorsement. We are grateful to our Youth Accessibility Leader Zoe Santi, daughter of manager of specialized services Heather Marsden. Zoe was a summer student in 2018. She successfully applied to be a Youth Accessibility Leader and wrote a wonderful summary of the project that was crucial to the successful application. A side-by-side tandem bike project will increase opportunities for people who are deafblind to participate in the healthy recreational activity of cycling in an accessible and safe manner. Cycling will take place on public trails and routes, increasing the opportunities for people who are deafblind to participate in and contribute to community life. 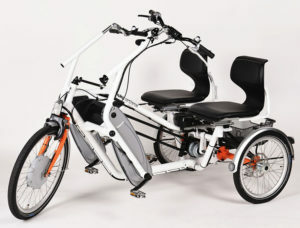 The style of bike, a side-by-side tandem, will contribute to the independence of people who are deafblind. A dual-drive pedal system will enable each rider to pedal at his or her own pace and ability, adding to their independence in the activity. Having people who are deafblind sit side-by-side with their intervenor enables crucial communication and sharing of information to take place. Sample of side by side tandem bike.